The production of PCBs always contains certain risks for our environment, especially for air and water. 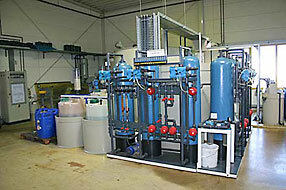 For example, chemical base materials, which may not get into the waste water circulation, have to be used. At the JKS Leiterplatten GmbH photochemical and electroplating manufacturing processes are deployed. These procedures are associated with great responsibility for the environmental protection. In addition to a consequent and complete avoidance of contaminated waste water we also own a closed water treatment plant corresponding to the actual environmental standards. By means of the anion – cation rotation service the used water will be prepared in a way that only the lowest amounts of fresh water are needed. Our machines are proofed regularly and unannounced by various authorities. For this reason the functionality of our environment system can be warranted any time. With this plant we fall short of the prescribed limit values for waste water below 60 %. All materials and liquids which accrue during the photo chemical production will be processed by our partner companies and represent a valuable raw material which even can be reintroduced into the economic cycle.